Airegard: Portable Air Scrubber - NuAire, Inc. The Airegard 112 Portable Air Scrubber effectively controls contamination through the recirculation of room air. The Airegard 112 Portable Air Scrubber effectively controls contamination through the recirculation of room air passed through a high efficiency particulate air filter. 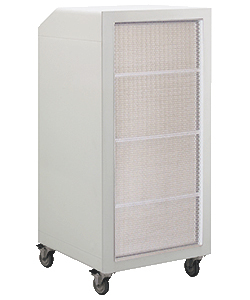 The air scrubber quickly attains ISO Class 7 or Class 8 clean air, where required.